“I’m not good enough to come to a Social Dance yet!” It’s amazing how many times I’ve heard people say this. This mentality is a huge obstacle to both your learning and enjoying ballroom dance! We recommend a three-pronged approach to learning ballroom. Group classes are an inexpensive way to get your feet wet, learn some patterns, and practice dancing with a variety of partners. Private lessons hone your skills with partner connections and technique, and address individual needs. Social dances give you the opportunity to have fun practicing what you’ve been learning, putting it all together and learning how to navigate a floor filled with dancers. Above all, keep your partner safe. Don’t crash into other people or things, and don’t let people step on your partner. It’s better to hold completely still than to proceed if your partner is in danger. This leads into the next point, which is that overall you should think about your PARTNER. Most people make the mistake of focusing too much on themselves. Leaders are worried that their partner will find them boring because they lead the same pattern twice, or they’re concentrating so hard that they’re always looking away from their partner and grimacing. Followers are so worried about looking good and trying to anticipate what their leader is going to do that they become “pully” or “heavy” and very difficult to lead. Leaders, focus on your lady – look at her occasionally and smile! It will make her happy to know that you’re glad to be dancing with her and not wishing you were somewhere else! And for goodness sakes lead the same pattern twice, or even three times – your follower will be so relieved because she’ll recognize it better the second time and follow it easily! Your follower would rather have you lead 3 simple patterns fluently with only one basic in between, than have you do 17 basics in a row while you try to remember the complicated pattern you just learned. Followers, focus on your leader and what you can do to make his life easier. Look at him whenever possible – visual cues are incredibly important. Be in charge of balancing yourself, and make yourself easy to move and steer – not by anticipating, but by LISTENING with your whole body. HE is in charge – don’t set the speed or pull him through a move or in a direction of your choosing. You will look great if you are in synch with your leader. And that means whether he is in synch with the music or not! Your music is the music in his head (not the music in your ears). Say yes! Always say yes if someone asks you to dance, unless they have been inappropriate while dancing with you in the past (i.e. suggestive comments or touching, overleading, critiquing, crashing into others). “I don’t know this dance” may or may not be a reason to say no – it would be better to say, “I don’t know this dance, but I’d love it if you’d show me a little!” Some folks may not get asked to dance if they are sitting in a corner, or if they appear to only be dancing with the person they came with. If you’re a lady who wants to dance with lots of leaders, get yourself near the edge of the dance floor and ask another guy to dance so leaders will know that you’re happy to mix. However, do not do more than one dance in a row with the same person (unless you came with them, and even then it’s not the best idea!). Thank your partner for the dance and walk off the floor with them, then find your new partner. It’s fine for ladies or gents to do the asking. Dance with everyone! Dancers who are stronger than you are will bring your technique level up and the experience will remind you how LIGHT your leads should be. Dancers who are not as strong will help you to refine your basic actions, giving you a chance to practice your technique and anticipate what the lady needs in order to understand what you want. DO NOT CRITIQUE YOUR PARTNER! It is a SOCIAL dance, not a lesson! You are both students. If your partner ASKS for your feedback, you may gently give a little; but taking it upon yourself to assume the role of another dancer’s teacher at a social event is extremely presumptuous and offensive. Wear clothing that covers your armpits, and bring a change of shirt if you tend to sweat. Remember to go heavy on mouthwash and deodorant, light on perfume and cologne. 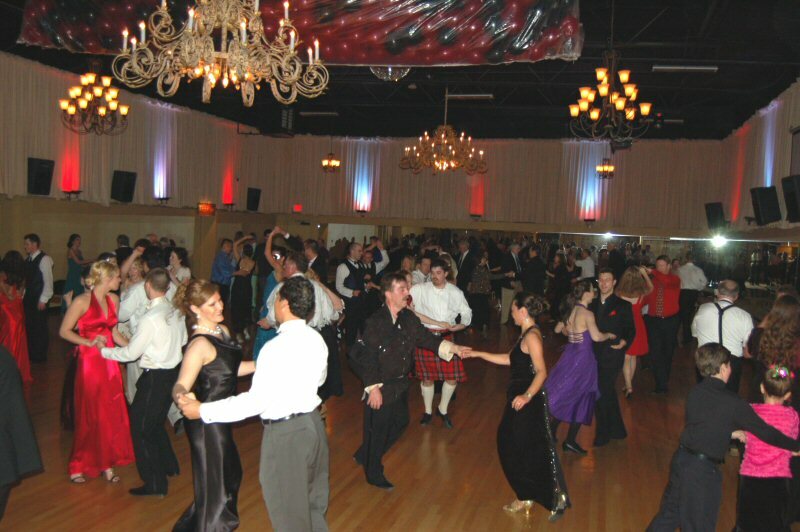 If you’re doing a stationary dance (like Swing) while others are doing a traveling dance (like Quickstep), make sure to stay near the center of the dance floor so that others can dance around you. Go dancing at places where you’re the best dancer, and places where you’re the worst dancer. If you’re at a wedding or company party, doing even the basic step will get you lots of attention and remind you that you already know more ballroom than 75% of the population! If you’re at a studio party with some great dancers, it will inspire you and make you hungry to improve! Show up! More people = more energy = more fun for everyone! Other dancers will be glad to have you there – they came to dance, and they’d rather dance with you than stand around waiting for a turn with one of the few people who did show up! The more at a social, the more chance there is that everyone gets to dance! Afraid everyone is looking at you? Think about it – when you go dancing, don’t you watch the best 1 or 2 couples on the floor? If you’re one of those couples, congratulations on the hard work you did to get there! If you’re not, no worries, no one’s watching you anyway!